Echuca, an Aboriginal word which means ‘meeting of waters’ (Place names of Victoria), was settled by Europeans in 1843 and by 1854 the population was 1500. 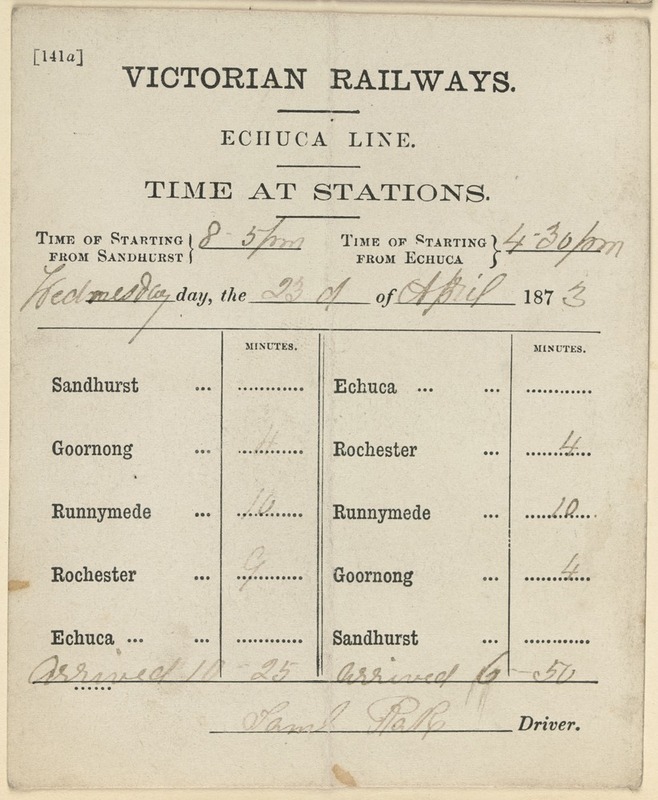 Prior to the opening of the rail line, travel to Echuca from Melbourne took 22 hours; catch the train to Bendigo (then known as Sandhurst) for an overnight stay, then onto the 6 a.m. coach, arriving in Echuca at 5pm (The railways of Echuca, p 3). 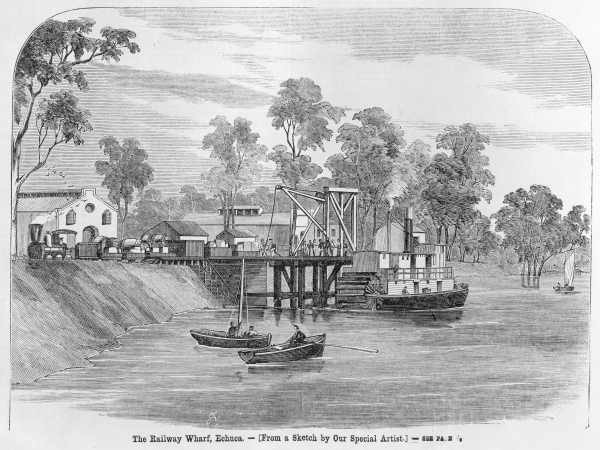 Before the rail line, trade was restricted to steamers and barges along the Murray. ‘The South Australians pioneered the river trade, but they quickly found that Victoria reacted strongly to the challenge for the wool trade of the vast Riverina, and for the supplying of stores and stations’ (Rich river, p28). The train line also reduced the costs of goods. ‘Goods bought by steamer were up to thirty percent cheaper in Echuca than goods bought by dray in Melbourne’ (Echuca: a history, p 53). When the first train arrived, according to the Bendigo Advertiser ‘…the Echucians met the party with faces betokening astonishment and delight’. The first train-whistle the Echucians heard was from the “2-4-0” type which may have sounded a bit like this. Echuca became the home port of the Upper Murray, with rivermen converging on the town. Shipping companies made their headquarters there, population trebled and by 1864, the number of licenced public houses had quadrupled. Melbourne merchants and wool buyers appointed agents to oversee trade between river steamer, train and carriers dray (Echuca: a history, p 93). The railway also meet with the new wharf, which allowed for the immediate unloading and loading of goods. This surge in efficiency, situated close to three major rivers (Goulburn, Campaspe and Murray) resulted in Echuca growing into Australia’s largest inland port by the 1870s. 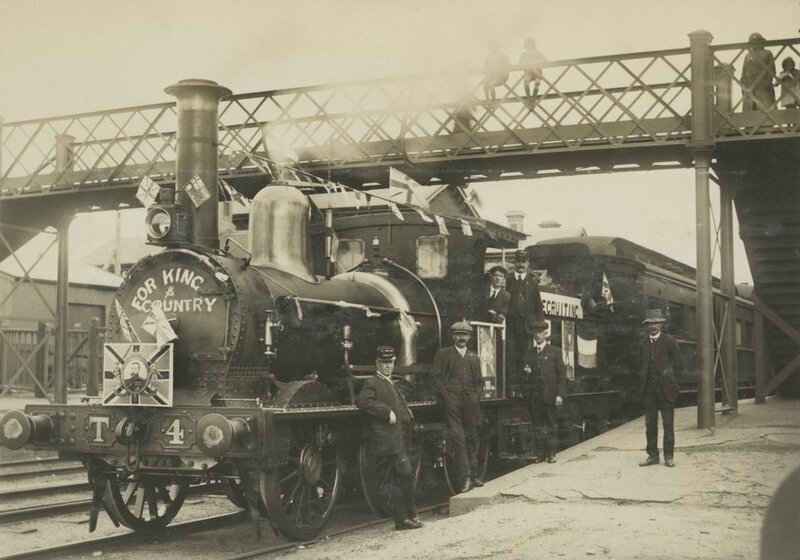 This year marks the railway’s 150th anniversary. The State Library holds a large collection of Victorian railway photographs. The soundscape is terrific, my fellow commuters on the bus were delighted. really brings the story to life! Thanks Ann- I love the sounds as well- helps me to imagine.